Historical Black Hills characters, both factual and fictional, have taken center stage in the successful HBO series Deadwood. C. H. (Charlie) Utter was born near Niagara Falls, NY in 1838. He spent his youth in Illinois, then moved to western Colorado Territory in the 1850s where he earned his reputation as a trapper, prospector and a popular, well-known packer and guide in the silver and gold regions of the Rocky Mountains west of Denver. Coming in at only five feet six inches tall, Charlie apparently made up for his size by his “dandified” appearance. He wore his blond hair long, complemented by a moustache. He was described by Leander P. Richardson in a Colorado newspaper as a “courageous little man” who wore beaded moccasins, fringed leggings and coat, revolvers mounted in gold, silver and pearl and a belt with a big silver buckle. 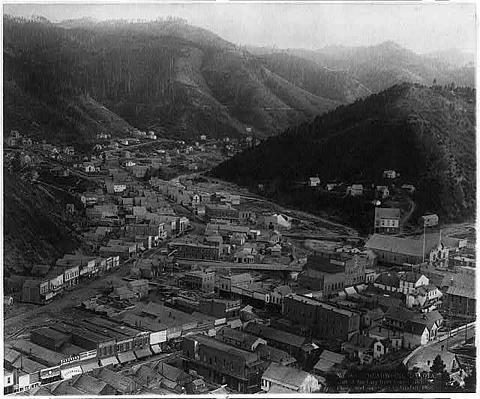 In 1874, Utter predicted the Black Hills gold rush would be a “lallapaloozer”—so in the spring of 1876, he organized a wagon train in Georgetown, Colo., and headed for the new gold fields. When the wagon train passed through Cheyenne, Wyo., it picked up more than 100 people awaiting safe passage into the Indian Territory of the Black Hills, arriving in Deadwood in July 1876 on what turned out to be one of the most famous trains to ever enter the camp. Other travelers included prospectors, gamblers, musicians and several well-known characters: Wild Bill Hickok; Madam Mustache and Dirty Emma and their “working girls”; and Calamity Jane – the latter picked up at Fort Laramie where she had been thrown in the guardhouse for being drunk and unruly. No reference has been found in Colorado to Utter being called “Colorado Charlie”, which suggests that the name may have been first given to him on the trip to Deadwood. Neither is it certain where or when he and Wild Bill first met. But by 1876, in Cheyenne, Wyoming Territory, they were considered partners. Utter and Hickok apparently shared a mutual respect, and based their partnership on that. Utter’s biggest contribution to Hickok seemed to be to protect him from his worst enemy — himself. Hickok’s excessive drinking and gambling habits were often monitored by Utter, not that Utter could do much about them. Several sources recorded that Hickok had a premonition of his own fate when Utter and the others in the party set up camp on the south side of Whitewood Creek. “I have a hunch that I am in my last camp and will never leave this gulch alive,” Hickok supposedly said.